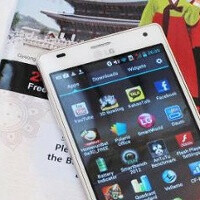 The LG Optimus 4X HD went up for pre-order in its traditional black version, but while we’re still waiting for the official release date for the quad-core device, a white version has surfaced in China. With the same boxy looks and no changes in the design, the pale version of the handset is painted white on both front and back. If the Optimus 4X HD gets released to expectations we should be seeing it on shelves in June. Check out the images and video of the handset in actions, all below and let us know how you like what you see in the comments. This phone is awesome heard that 4x supports upto 64gb sd card. That's a total of 16+64=80gb. 4x beats one x. Don't believe me google it. It looks like a Samsung Galaxy phone. It doesn't look anything like the iPhone. What, just because it's white and square? I know that, though. Just saying. White/Stylish.. who cares, LGs are typically are a disaster. i heard LG starts from the scratch as they update the new looks of their UI im ive seen the optimus 4x hands on and its pretty enticing! esp. in white how i hope it is made in a premium plastic..